James and Angelina Moriarty are settling into their new marriage and their fashionable new home -- or trying to. But James has too little to occupy his mind and Angelina has too many secrets pressing on her heart. They fear they'll never learn to live together. Then Sherlock Holmes comes to call with a challenging case. He suspects a prominent Harley Street specialist of committing murders for hire, sending patients home from his private hospital with deadly doses or fatal conditions. Holmes intends to investigate, but the doctor's clientele is exclusively female. He needs Angelina's help. 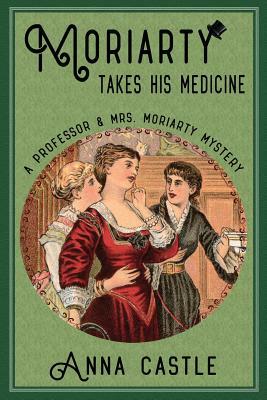 While Moriarty, Holmes, and Watson explore the alarming number of ways a doctor can murder his patients with impunity, Angelina enters into treatment with their primary suspect, posing as a nervous woman who fears her husband wants to be rid of her. The Moriartys throw themselves into the investigation -- but not together. Then a hasty conclusion and an ill-considered word drive them apart, sending Angelina deep into danger. Now they must find the courage to trust each other as they race the clock to win justice for the murdered women before they become victims themselves.